Since 2004, the Mobile Outreach program has been connecting with and delivering meals to vulnerable people on the streets in St. Catharines. The program was expanded to deliver these services throughout the Niagara Region with the assistance of the Niagara Region Homelessness funding in 2011. The Mobile Outreach program was designed be a visible response to people living on Niagara’s streets with the provision of basic goods (food, sleeping bags, clothing), a regular schedule, consistency in staffing and act as an entry point to a comprehensive system. Our continued goal is to develop trust, care for immediate needs, provide linkages to services and resources, and to help people get connected to mainstream services and ultimately into the community. We administrate street outreach work that is part of a respected, integrated, well coordinated and resourced service that meets the needs of and empowers people who are or at risk of being homeless. The Salvation Army works in partnership with other agencies and community volunteers to provide a holistic approach to address all individual needs. 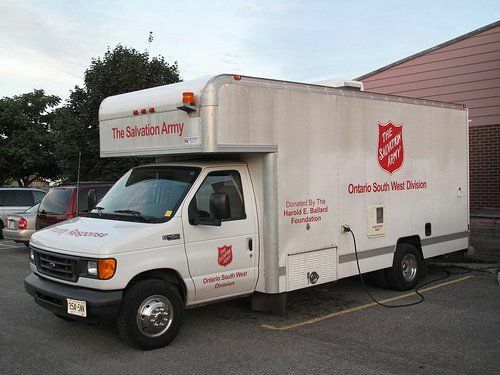 Provide evening Mobile Outreach services in the communities of St. Catharines, Grimsby, Beamsville, Niagara Falls, Fort Erie, Welland, Port Colborne six nights per week at regular stops. See scheduled stops for your community.